Cornus kousa 'Miss Satomi' produces a blanket of large, rich pink flower bracts in June, somewhat later flowering than Cornus florida varieties. These can be followed by rosy-pink ornamental fruits. The shiny ovate foliage is dark green and gives way to attractive orange and red autumn colours. This Pink Flowering Japanese Dogwood is a lovely small tree or large shrub with almost tabulate branches that create a very attractive form. 'Miss Satomi' has the RHS Award of Garden Merit and will grow well in any sunny or partially sunny position given well drained soil. 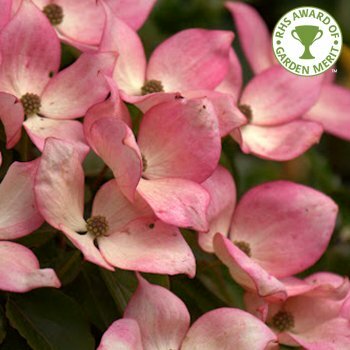 Our pot grown Miss Satomi Dogwood trees can be planted at any time of the year. Start by removing weeds and grass within a metre of your desired planting hole, then dig a square hole as deep as your root mass and roughly 1.5x as wide. To help the plant establish, sprinkle Mycorrhizal Fungi in the hole. If you’re planting Miss Satomi Dogwood in spring or summer, water well and regularly for the first few months. Take care to water the soil, not the leaves which can lead to scorching - irrigation kits make this easier. Increase watering in extended periods of hot or dry weather, but avoid over watering as Dogwood does not like wet soil. If you’re planting in autumn, you may only need to water a little. Once planted, keep the area free of competing weeds and grass for the first few growing seasons. Don't mulch around the base of Japanese Dogwood with bark. Japanese Dogwoods creates an appealing shape, so the only pruning required is to remove any damaged or diseased branches. The only time to hard prune a Dogwood tree is to control the overall size or internal canopy or if there is not enough light reaching the inner branches.